Mutton Kosha is a Bengali delicacy which can be served with plain rice / basonti pulao / luchi. 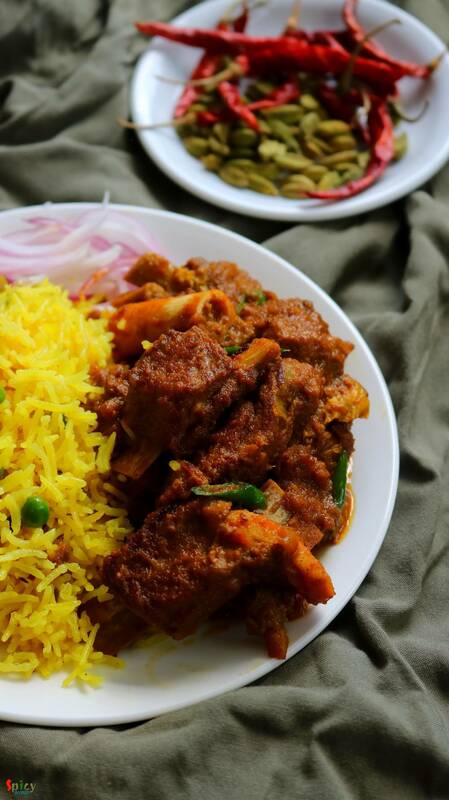 Mutton kosha requires patience, kosha means slow cooking in oil and spices. 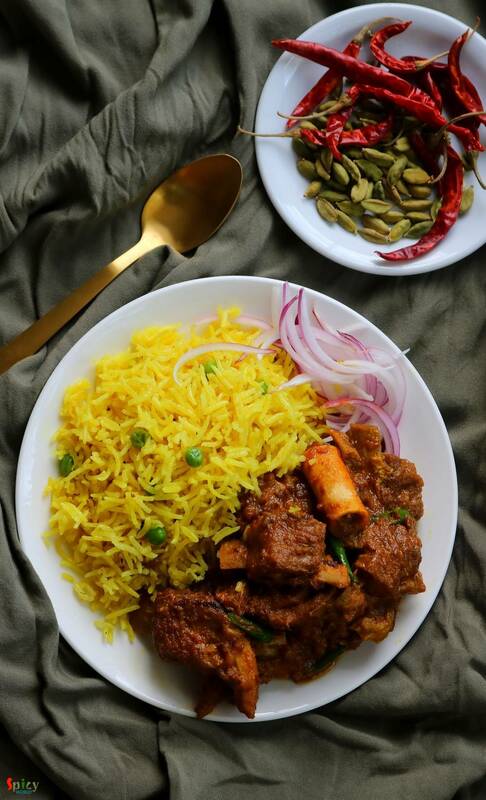 Off course to hurry up the process you can use pressure cooker, but slow cooking is recommended and this mutton curry like any other curry tastes better on next day. 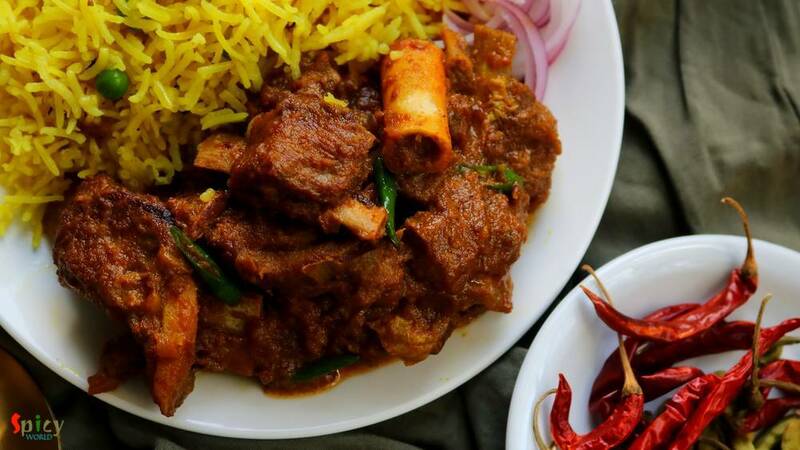 We have one more variance of the Mutton Curry called Kosha Mangsho (Thakurbari style), you can also try that. Now its time for you to enjoy this recipe, lets start with the video. 500 grams of medium size mutton pieces. 2 Tablespoons of ginger garlic and green chili paste. 1 Tablespoon of raw papaya (with skin) paste. 3 - 4 Tablespoons of yogurt. Spice powder (1 Teaspoon of turmeric powder, 2 Teaspoons of red chili powder, 1 Tablespoon each of roasted cumin and coriander powder). Whole spices (2 bay leaves, 1 dry red chili, 4 green cardamom, 4 cloves, 1 small cinnamon stick). 1/4th Teaspoon of kashmiri red chili powder. Pinch of javetri or mace powder. 2-3 cups of hot water. Marinate the cleaned mutton with yogurt, 1 Tablespoon of ginger garlic green chili paste, raw papaya paste, some salt, all of the spice powder and 2 Tablespoons of mustard oil. Mix well and keep it in the refrigerator for overnight or at least 5 hours. Then heat mustard oil in a pan. Saute the whole spices for few seconds in hot oil. Then add onion slices and fry until they become golden in color. Add marinated mutton pieces along with the marination. Cook on high heat for 10 - 15 minutes. Then add kashmiri red chili powder and cook for 10 minutes on medium flame. Add another Tablespoon of ginger, garlic, green chili paste, cook for 5 minutes for a nice aroma. Now add 2 cups of hot water, 1 Teaspoon of sugar. Mix well, cover the pan and cook until the meat becomes soft. If the curry becomes dry add some more water. To hurry up the process you can cook the mutton in pressure cooker until 6-7 whistles come. After cooking the meat properly, add javetri powder, garam masala powder and chopped green chilies. Mix well and turn off the heat. 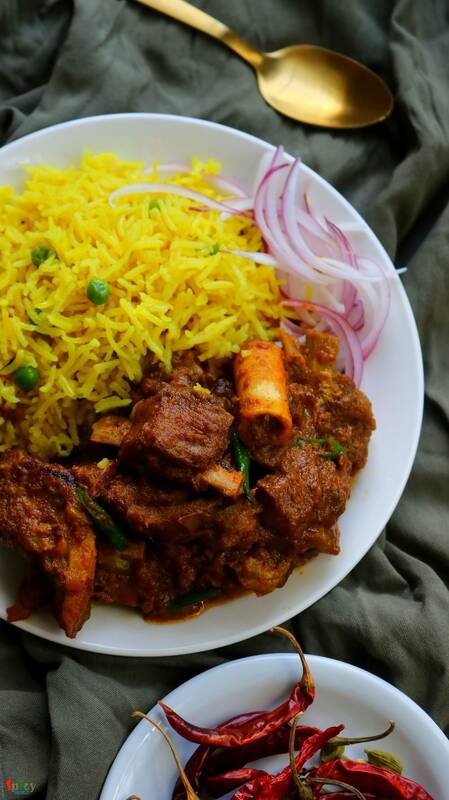 Your kosha mangsho is ready to serve. Serve this hot with basonti pulao or luchi.